Mum gives birth with entire family watching - would you be able to do it? Mum gives birth with entire family watching – would you be able to do it? Labour is a beautiful thing, despite the rather intense (and gooey) moments throughout. But would you be comfortable having your entire family supporting (and watching) as you labour and deliver a baby? This woman did it. And she has the most stunning images to remember this momentous occasion. Have a glimpse into a home birth/family reunion like no other and tell us, who did you have with you when you delivered your little one? Family means everything and these images prove the power of family ties, even through the most intimate of events. Baby Oscar made his appearance surrounded by the ones who love him the most, including his mother, his father, two of his aunties, his grandma and his little sister. 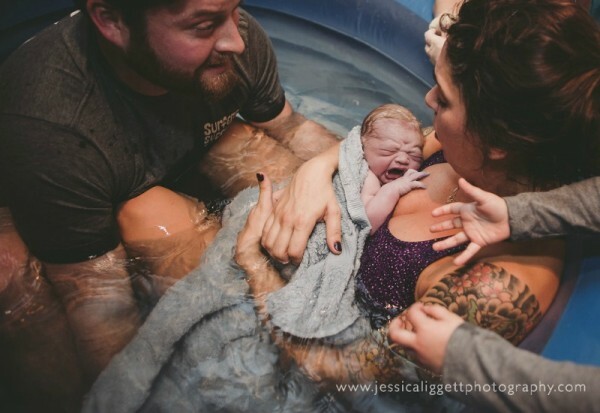 And US birth photographer, Jessica Liggett was there to capture the entire process. We at Babyology absolutely adore birth photography, but never before have we seen a birth like this. Carla delivered her little man Oscar in a water birth at home with a soccer team of support. All of these images are absolutely beautiful but perhaps the most amazing one is where Carla’s daughter, two-year-old Olive, is touching her mother’s face, helping her through a contraction. The power of family has never been more strikingly captured than in this series. See all the images in this stunning sequence at Jessica Liggett Photography or through Jessica’s Facebook page. Tell us Babyologists, who was in the delivery room with you? Would you be comfortable with your entire extended family watching?